Stop the Torture! Close Guantanamo! Sign ad to be published in NYT. The courageous hunger strike at Guantánamo has thrust this hellhole of made-in-America torture and torment to the world's attention. It is crucial, and of utmost urgency, that the fight to close down Guantánamo be intensified, deepened, and broadened in the days ahead. As the 100th day of the hunger strike occurs, Andy Worthington, author of the Guantanamo Files will appear at Revolution Books by Skype to talk about the situation of the prisoners, and expose the legal arguments the U.S. government under first George Bush, and now Barack Obama has used to justify its outrageously inhumane treatment of people it labels "enemy combatants." Protests demanding the closure of Guantánamo have occurred in several U.S. cities, and across the world. 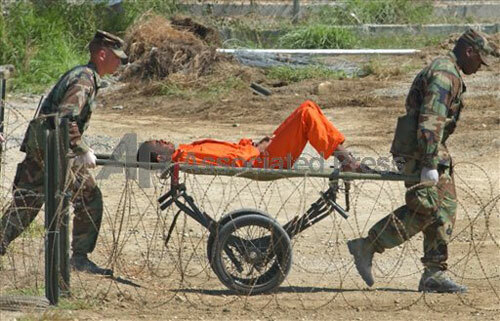 More are planned in the days and weeks ahead, in particular the "International Days of Action" initiated by the London Guantánamo Campaign, for May 17-19, marking 100 days of the Guantánamo hunger strike. In addition, an Internet petition demanding the closure of Guantánamo gathered over 65,000 signatures in its first day online. Stop the Torture! Close Guantanamo! End the War Crimes and Violations of Fundamental Rights! Sign and contribute to published ad in NYT. Revolution Interview with Andy Worthington Hunger Strike at Guantánamo Bay: "Respect us or kill us"
More information about these important activities can be found at worldcantwait.org, andyworthington.co.uk, and londonguantanamocampaign.blogspot.com. Andy is a freelance investigative journalist, the author of "The Guantanamo Files: The Stories of the 774 Detainees in America's Illegal Prison" and the co-director (with Polly Nash) of the documentary film, "Outside the Law: Stories from Guantanamo"